A Tale of O, the most popular video about diversity worldwide, is unique both in style and content. 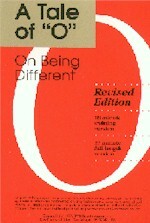 It shows the striking consequences of being “different” from the others around you – being an O among Xs. The videotape illustrates dramatically how this alone powerfully affects both the Xs treatment of an O and the O’s view of itself, regardless of the nature of the difference. Whether the O differs from the Xs by gender, race, age, language, age or other factors, the effects are similar. This differential treatment of Os, especially when the difference is highly visible or socially important, is often taken as a sign of bias or deliberate discrimination. A Tale of “O” shows to the contrary that much of this different treatment is largely a consequence of the situation. It is not necessary to blame anyone, unlike many other approaches, which may punish and blame people quite unfairly. A Tale of “O” helps everyone identify with Os since everyone has been an O at one time or another. Moreover, the video suggests whole new avenues to systemic solutions. A Tale of “O” is narrated by its originator, Dr. Rosabeth Moss Kanter of Harvard Business School. Here’s a link to a vendor that sells the video (in a DVD format). If you sign up for a username and password you can preview the video online in both the 18 and 27 minute format. I used this video to do training for supervisors on how to integrate women into male-dominated occupations such as law enforcement and cable installation. I prefaced showing it by mentioning that the narrator has a high sing-song voice, which can be distracting. I’d recommend others do that as well if they are showing it in a predominantly male setting. Thanks a million and please carry on the enjoyable work. Its like you read my mind! You seem to know a lot about this, like you wrote the book in it or something. I think that you can do with some pics to drive the message home a bit, but other than that, this is excellent blog. I really like what you have acquired here, certainly like what you are saying and the way in which you say it. You make it enjoyable and you still take care of to keep it smart. I can not wait to read far more from you.